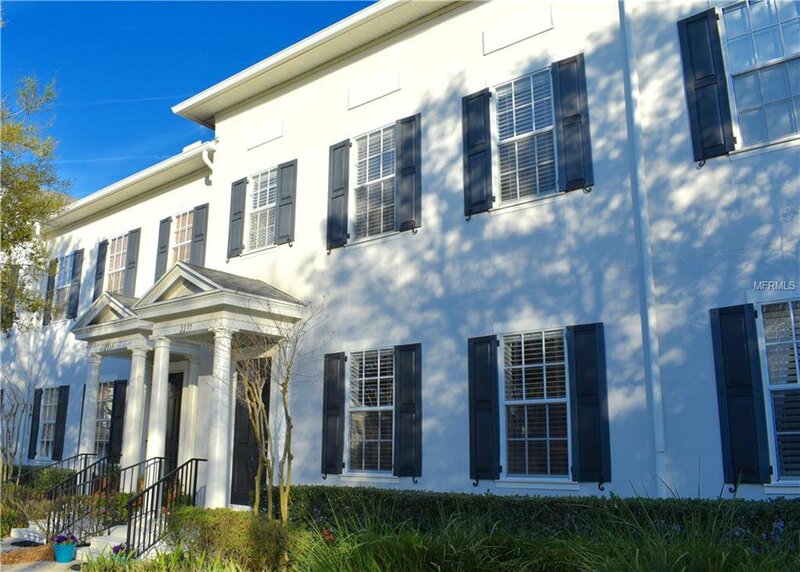 Upscale townhouse, with 1ST FLOOR MASTER, on one of the most sought after parks and streets in Baldwin Park. Overlooking the beautiful greens of Osprey Park, this all block, interior unit boasts an even more elegant interior! Enter into the Foyer overlooking the open Living and Dining, with architectural columns with one-of-a-kind wainscoting, to make each space look completely finished. There is a nice sized Powder Room just under stairs for guests. Just through dining area, you will find a secluded Kitchen that opens to the Family Room. The Kitchen has been nicely updated with blue glass tiles, all stainless steel appliances and large solid stone island. Entire first floor also has beautiful wide plank wood flooring. Nestled in the back of the home is the large Master Retreat with bright and light Master Bath and large walk-in closet! There is also a full sized Laundry Room downstairs, which includes washer and dryer. The Back Yard is gorgeous and low maintenance! Landscaping is well thought out. From the elevated Sun Deck to the maintenance free astroturf space, you will find many cozy corners to read a book, and plenty of room to host a get together. Large custom planter box conveys. Upstairs, are two additional bedrooms and Bath that are a very nice size with LARGE CLOSETS! This home has every bell and whistle, including central vac. Two car Garage also has very high ceiling and could easily accommodate a lot of overhead storage. A lovely find on the park! Listing courtesy of PENNY BROKERS INC. Selling Office: PENNY BROKERS INC.